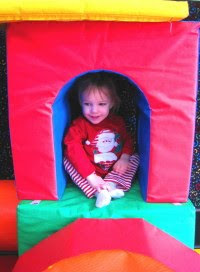 Tomorrow, Wednesday December 9th is FunFit in Rockville’s Holiday Safe Winter Open House. Starting at 9:30am and continuing on well into the evening, this fun fitness and play center for babies, toddlers, preschoolers and kids is open all day FREE! And there’s going to be firefighters and firetrucks too, as well as big discounts on signing up for winter classes, winter and summer camps, and birthday parties (we’ve had one here – way before I started this blog – and it was faboo for my son and his pals.) There’s even an adult exercise class offered at 7:30pm and Family Yoga in the evening too! FunFit also has a rocking indoor open gym every Monday from 2-3:30pm, Wednesday 10am-2pm (perfect for little ones and playgroups that like to get out before naptime), and Fridays 1:30pm-5:30pm (except on the 4th Friday of the month, when it’s extended to 7:30pm.) Rates for open gym are listed here, and if you sign up for a FunFit class you get FREE unlimited open gym all winter long! 10am Bayou Buddies Music 18mos-6yrs. 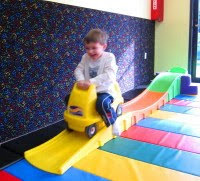 10:30am FUNdamentals preschool prep (theme of the Day: CARS) 2-4yrs. OUTSIDE: Visit with our neighborhood firemen, Firetrucks and all! 3:45pm BALLET (2-6yrs) Watch a class in session. 5:00pm Family Yoga ages 3-12yrs. 6:30pm – FUNfeet Dance 3-7yrs. Want more info on the classes being demoed and that you may visit with your kids tomorrow? Click here for class descriptions. So if you were racking your brain on where to play tomorrow, now you know to head to FunFit for free, fabulous fun.